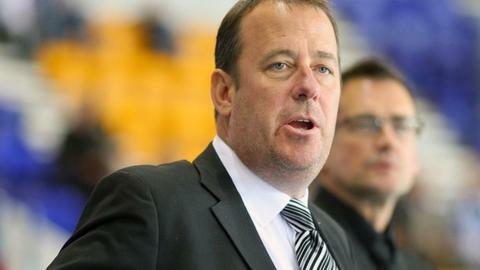 Sheffield Steelers have appointed former Great Britain boss Paul Thompson as their new head coach and general manager on a two-year contract. The 50-year-old guided Coventry Blaze to four Elite League titles and spent five years in the Great Britain job. He replaces Gerad Adams, who was released by the Steelers despite leading them to the Elite League title. "I believe that Paul will challenge the rest of us at the club to be better," owner Tony Smith said. "These are exciting times and the start of new era. "Paul will oversee all of our hockey operations and that includes the new under-20s side we are keen to start when the national under-20s league commences." Thompson had been working as coach of Danish side Aalborg. "I had every intention of remaining in Denmark and signing a long-term contract there with Aalborg this summer," he said. "I enjoyed Denmark but it would have also meant three years away from my family and that was something of a consideration. "I met Tony Smith and he outlined his plans for the club. It ticked a lot of the boxes for me as a head coach and GM. "It got me thinking and it got me excited. I hadn't any intention of returning to the UK but Sheffield and the Steelers, well that's different."